Gattaiola’s Villa Rossi was built by Nicolao Civitali in the early years of the 16th century for Francesco Burlamacchi, a generous and visionary citizen of Lucca.. To oppose the growing power of Florence and refute the corrupt practices of the church hierarchy, he organized a plot with the dual purpose of uniting the smaller Tuscan cities in a league and introducing the Protestant Reformation into Lucca. Betrayed by several of his closest co-conspirators Burlamacchi was arrested, tried, condemned and beheaded. The villa was confiscated and put at auction, passing down after that from one family to another. In the latter 17th century, succeeding proprietors commissioned decorations on the walls of the loggia and state rooms that went on for nearly a hundred years. Notable among the numerous painters who participated in the work over time were Bartolomeo de Santi and Antonio Cecchi. At the end of the 19th century, the villa and all its property was acquired by the Dutch Count Emilien de Nieuwerkerke, a childhood friend of Napoleon III. He had been director of the French state museums during the Second Empire, and was a painter and sculptor as well as the lover of Princess Matilde, the Emperor’s intellectual cousin. When the Empire fell, the count fled Paris disguised as a coachman on a carriage in which three generations of the Russian princesses Cantacuzene were traveling, who were his protectors and – as rumor had it – also his lovers in chronological order. After an eventful journey they arrived at Gattaiola and lived happily together in the villa. When the youngest of the princesses, Olga, reached marital age the old count found a perfect husband for her in Prince Altieri, and as a wedding gift offered the couple the entire Gattaiola property with the proviso that he would continue living at the villa as their permanent guest. The museum at Compiègne recently dedicated a major exhibition to Nieuwerkerke, and many reminders of him still can be seen at the villa. The four large paintings hanging in the salon portray Emperor Napoleon III, Empress Eugenie (painted by Winterhalter), Nieuwerkerke and Princess Olga. The marble busts of Olga and Prince Altieri were sculpted by Nieuwerkerke himself. The cast in the library is of Princess Matilde’s hand. In 1940, the villa was sold at auction to Paolo Rossi, a Genoese who wanted to get his family away from the bombings in Genoa. A well-known anti-Fascist and author of two books the regime had seized and burned, he found the personality of its first owner a great incentive for acquiring the villa. Paolo Rossi spent the entire war in Tuscany, in part at Gattaiola and in part on the Apennines with the partisans of the tenth-zone command. A socialist, he was elected to the Constitutional Assembly after the war. He was among the 75 members who planned the constitutional basis of the new republic, and was one of the 18 who drafted the Constitution itself. He was reelected several times in succession, and later presided over the Constitutional Court during the Lockheed trial. 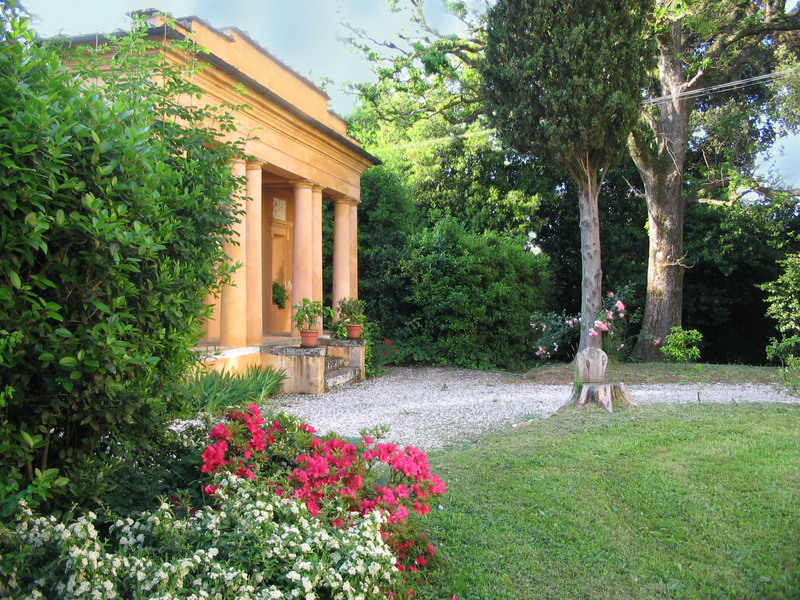 The present owner of the villa is Paolo Rossi’s daughter, the author Francesca Duranti.